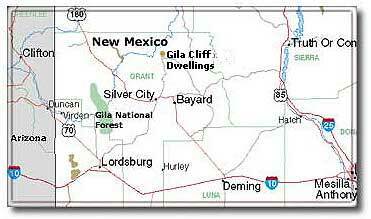 Situated in the foothills of the spectacular Pinos Altos Mountains, Silver City lies just east of the Continental Divide, in southwestern New Mexico. Norman Ford, in his recent book, 50 Healthiest Places to Live and Retire, gave the historic community a high rating, primarily due to climate, elevation, terrain and "lack of urban stress." Silver City lies at the center of an outdoor recreation paradise. It is a gateway to the three-million-three-hundred-thousand-acre Gila National Forest. The forest includes the Gila Wilderness, the first land in the world to be set aside specifically as a wilderness area and, today, the largest wilderness in the Southwest. Silver Citys quiet, tree-lined streets, with their mellow adobe and stately Victorian homes from a bygone age, are but a short walk away from the busy downtown center with its modern shopping. Mining, ranching, tourism and the one-hundred-and-seven- year-old Western New Mexico University are the major contributors to a thriving economy. Silver City is noted for its clear mountain air, low humidity and four gentle seasons. The annual average temperature is fifty four degrees Fahrenheit, with mid-summer days in the eighties. Pleasant, above-freezing temperatures most of the winter provide near-perfect conditions for day and evening activities. The average annual rain/snow precipitation is just over fourteen inches. On average, the sun shines more than three hundred days per year, and there are at least one hundred seventy four growing days. Other Silver City notables include General "Black Jack" Pershing and Apollo 17 Astronaut Harrison "Jack" Schmitt. Exploring the great outdoors takes on a whole new meaning in Silver City and the surrounding area. Big and small game hunting, fishing, camping, hiking, "rock hounding," horseback riding, bicycling, motorcycling, golf, tennis, birding and "critter" watching in the wild are just a few popular activities for visitors and residents alike. For spectator entertainment there is a wide range of offerings,from symphonies and fine opera to the renowned "Cowboy Poetry" readings and wild west rodeos. Local museums and galleries are considered to be among the best in the Southwest. Nearby lakes include Bill Evans Lake, Lake Roberts and Bear Canyon Reservoir, all within an hour drive from Silver City. Lakes a little further afieldinclude Elephant Butte, Caballo Lake and Wall Lake. Anglers have a choice of brown and rainbow trout, catfish and bass. Within the Gila National Forest, there are almost five hundred miles of fishing streams. Someof the premier locations are at least partially accessible by road. They include Gila River stream junctures, the upper San Francisco River, Willow Creek, Negrito Creek and Whitewater Creek. Highways, forest roads and numerous single track trails around Silver City, combined with breathtaking mountain scenery, draw bicyclers to the area from all over the world. The annual Tour of the Gila Bicycle Race, held May 5th through the 9th,, is listed as a "National Prestige Classic" by the U.S. Cycling Federation. It is considered to be one of the toughest bicycle races in the nation. Several motorcycle tours over glorious winding roads with little or no traffic are also available. There are hundreds of superb hiking and climbing trails in and around Silver City. They include the City of Rocks State Park, a spectacular geological monolith rising from the desert floor; the famous Catwalk National Recreation Trail, which clings to the walls of Whitewater Canyon; and the beautiful Mimbres River Valley, where the Nature Conservancy has established a protected riparian area for some of the best bird watching in New Mexico.